Movements are founded on prayer. 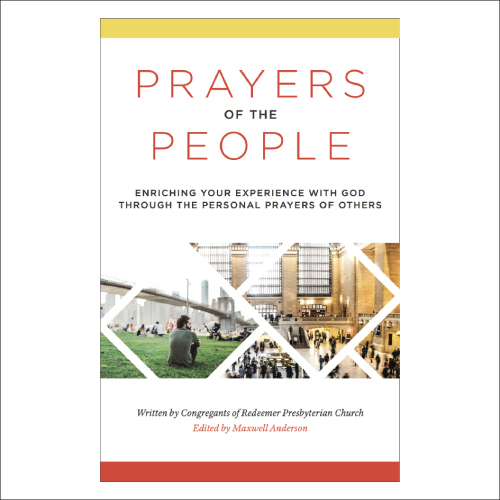 Want to enrich your experience with God through the personal prayers of others? It’s not too late to join the 10-part daily devotional of highlights from Prayers of the People? There’s nothing more important than prayer. You can’t know God without prayer. You can know a lot about him, of course, but you can’t know God personally without a prayer life. You can’t truly know yourself without prayer. It is only in the light of God’s presence that you can finally see your heart as it is. You can’t really love other people as well without prayer. If you have started praying regularly for someone, and then you meet with him or her, you will see how much more engaged your heart is. Love may lead you to pray, but then prayer profoundly deepens and enhances love. Finally, you can’t really get through the troubles, disappointments, and tragedies of life without prayer. This is the message of one of the most famous passages in the Bible: Psalm 23. We will only walk through the dark valleys without fear if we know his presence in prayer. Suffering usually makes you more anxious, more hardened and cynical, but through prayer it can make you wiser, deeper, kinder, and even more joyful. It is also extraordinarily important to listen to other people pray. Several writers have noticed that if you are part of a circle of friends, and one of the friends moves away, you lose more than just that particular person. If you lose friend A, you also lose, as it were, the part of friend B that only friend A could bring out. You can know an individual human being better in a community than simply one-on-one. Why? Because one-on-one you only see the part of the person that you draw out, and not all the other aspects of him or her that are visible in other settings with other people. Now if it is the case that the fullness of a finite individual human can’t be known and drawn out by only one person, how much more true is that of God? Every one of us, because of our unique experiences and traits, perceives certain facets of God’s infinite beauty and glory. But no one of us can glimpse even a fraction of the whole. Only if you worship with others and hear others pray will you begin to get a fuller view of God’s magnificence. Solitary faith, something that the Bible knows nothing about, will always produce a distorted view of God. That is why Prayers of the People is such a helpful and important volume. In it, you hear a remarkable diversity of people, from many walks of life, in a variety of human circumstances, all praising, confessing, thanking, and petitioning God. Listen carefully, and you will find that each soul is communicating her unique vision of God to you. And so we are enriched as we can be in no other way. Read this volume, turn some of the prayers into your own, and you will grow in grace and in the knowledge of the Father and of his son (John 17:3; 2 Peter 3:18). Also read this volume so that you can be pray for this vision of the Rise campaign: that New York would be a more just, beautiful, merciful, and kind city because the people within it are living more and more for God and their neighbor. What if the culture rising out of New York had the gospel in its DNA? Because of New York’s influence as a leading global city, it could catalyze renewal far beyond just one city. This is a vision that must begin and end in prayer. It begins in prayer because we could never accomplish all we hope to do in our own power. It ends in prayer because only that way will we increasingly become like our God who calls for the peace and flourishing of all.